This is a fresh, modern CV template with a clean clutter-free theme, designed with international or PR jobs in mind but equally suited to a wide range of professions. It utilises the classic Garamond font (free with MS Word) and includes a range of features. There is space for a photo, vertical text for extra details, room for quotes from references or key achievements and a lot more packed into this neatly designed template. We've included the education section first as this is more common with international jobs but it's very easy to switch around education and work history if you're going for a UK job. Free international or PR themed CV template	Overall rating:	4.8	out of 5 based on 8	reviews. 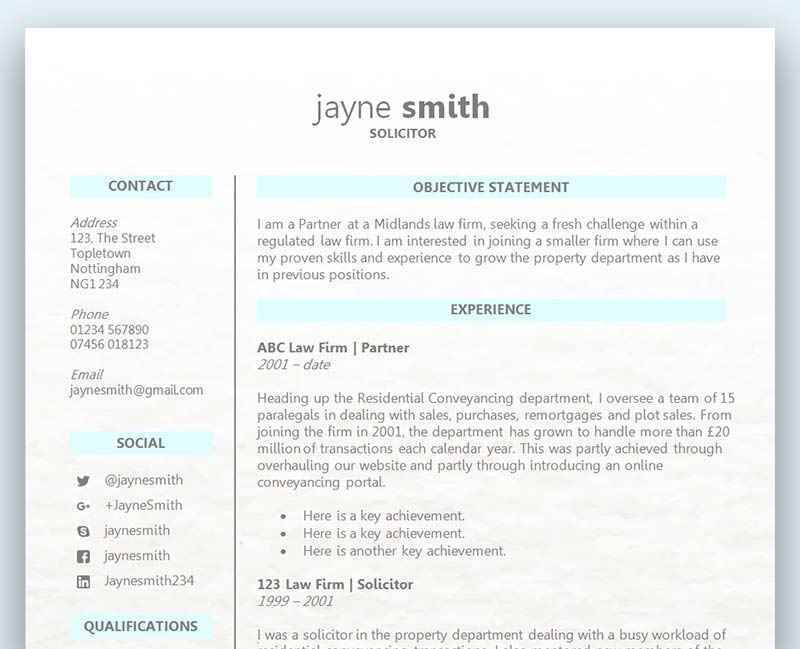 If you're looking for a fuss-free professional CV template to download, look no further - this lovely fresh template has a great layout which catches the eye, without distracting would-be employers from your job application. There's a lot of room for extra details but equally it's easy to customise if you want to swap around sections or move them altogether. Make sure you check out our CV editing guide if you need help with making a rounded CV photo - and you'll also find guidance on 'text boundaries' which will make editing this CV template a lot easier. You’ll see that we have flagged this CV template as particularly suitable for both international and PR roles. Why? This is because the skills required for such roles are quite similar. In fact, many ambassador roles specify PR experience as desirable. International CVs are different in some respects from UK CVs. Just like résumés, the education usually comes before the work history section (it’s normally work history first in the UK). Aside from that, an international CV isn’t vastly different in layout. Like the UK, it’s typical to confine your CV to just two pages and you’ll see many parallels with the UK when reviewing the different sections you need to include. International jobs are in high demand and require additional skills to a local or national job – so you’ll need to think carefully about how to complete each section with reference to the job specification. On a CV in the UK, this would be confined to your name, address, phone number and email address. In addition, if the job requires a driving licence, this would be included here. Depending on the job you’re applying for, you may need to include additional details here for an international CV. For example, you may wish to include your nationality if it is relevant to the job. The profile section at the top (which might be called ‘objective’ or ‘personal statement’ alternatively) is your opportunity to tell the employer how exactly you meet the job description. If you haven’t had direct experience of the role you’re applying for, it can be helpful to highlight the most important transferable skills and experience relevant to the role here. It’s worth including a little more detail here than you would for a UK CV if you have anything to mention that could be relevant to the role. For example if you were applying for a job as a European Ambassador and you had a history degree, a knowledge of European history may be an advantage and would be worth mention under ‘Subject areas’. Like a UK CV, you would include the most recent position first and give details of the company you’ve worked for, the dates you’ve worked there and your responsibilities (including any particular achievements if relevant). It’s critical to show that you have experience doing similar work to the role you’re applying to. If you haven’t done anything that’s identical, try to show how the experience you have would be relevant to the position you’re applying for. Listing off the same skills in the skill section as are included in the job advert won’t impress anyone. It’s better to give examples of how you’ve developed those skills. You don’t need to list every single skill detailed in the job spec – just pick out the ones that aren’t already covered by your work history. Remember that you might have developed these skills in other ways besides work experience – for example, through projects at school, volunteering, community projects or interests outside of work. Memberships won’t be relevant to everyone but as they can show an interest in relevant industries and sectors, they can be a valuable way to demonstrate to employers that you’re genuinely passionate about what you do. As for memberships, awards won’t be relevant to everyone – but if you’ve received any awards that are relevant to the post you’re applying to, it’s worth mentioning these. Interests help paint a picture of you as an individual and provide another opportunity to show skills. In the example CV content, the candidate is a member of several hiking groups. This suggest skills such as networking and communication, in addition to showing the employer that she takes an interest in her health. It’s usual to include a reference from your most recent employer and another reference which might be a previous employer or (recent) university or college tutor. Other suitable second references include a senior figure involved with a project you’re working on (such as voluntary work or a community project), or a person (non relative) who has known you for a while in a professional capacity. Quality references can boost a CV – for example, a secondary reference from an MP, University dean or senior public figure would certainly add credibility. If you’re currently in employment and not keen on your current employer being contacted before you’ve been offered a job, it’s acceptable to write, ‘references available on request’ – or to give two other references for the time being. However, if you’re offered a job, the prospective employer will almost certainly want to contact your current employer at this point. If you’re applying to an international organisation based in another country, consider translating your CV (unless the job application requirements specify otherwise). It shows that you’ve thought about the needs of the organisation receiving your CV and it gives you the opportunity to demonstrate your language skills. It also ensures that no important details are ‘lost in translation’.